The ruins of Great Zimbabwe extend over 720 hectares of rocky hill and valley in south-central Zimbabwe. The dry-stone walls, many of monumental scale, and earth houses, were built over many centuries of the African Iron Age, between c.AD 1100-1500. They divide into three main groups: the Hill Complex, the Valley Ruins, and the Great Enclosure. The latter is the most spectacular and substantial complex on the site. The outer wall, 278m long and up to 9.5m high, is the largest single prehistoric structure in sub-Saharan Africa. The interior contained earth-house platforms, stone-walled enclosures, and architectural features including a massive conical tower. First noted by Portuguese writers in the 16th century, serious archaeological investigations did not begin until 1905.
een found on the site, possibly totemic representatives of the ruler and his clan. 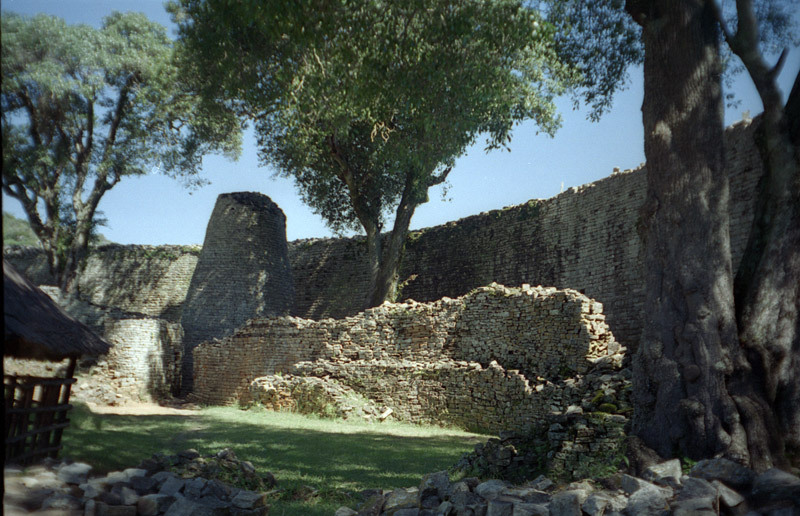 The people of Great Zimbabwe were the Bantu-speaking ancestors of the Shona. European colonialists from the 16th to the 20th century denied anything as impressive as Great Zimbabwe could have been constructed by ‘inferior’ native black Africans, citing Phoenicians or Arabs as the most likely architects. Some believed King Solomon or the Queen of Sheba were responsible. Perhaps Great Zimbabwe was the gold-rich biblical land of Ophir? Only later activity on the site – ‘the filth and decadence of the Kaffir occupation’ – was attributed to native Africans. As late as the 1970s, the Rhodesian regime of Ian Smith continued to deny Great Zimbabwe had been built by Africans. The first to propose its indigenous creation was David Randal-MacIver, whose investigations at the site in 1905-1906 had yielded mainly African artefacts. Then, more stratigraphically detailed work was carried out by Gertrude Caton Thompson, in 1929, who reported conclusively that Great Zimbabwe had been built by Bantu speakers in the Christian era. Archaeological work at the site thus destroyed a racist argument designed to justify slavery and imperialism, proving the common humanity and creative potential of all the world’s people.